Memories of my first NHL game are vivid in my mind – I was a sophomore in high school in Maryland and went with my friend Kristel and her family to a Washington Capitals game in the old Capital Centre. The energy in the arena was electric, and I was instantly hooked. Fast forward to college in Missouri, and friends and I would go to see the St. Louis Blues play the Chicago Blackhawks. Now there’s a rivalry! Sometimes, we’ll even plan trips to visit our friends Nikki and Mark in St. Louis around a Blues game to catch some of the action. When my friend Nikki and I were vacationing in LA, we found ourselves in the owners’ box at an LA Kings game when Gretzky was still playing (thanks, Run Run Jones!). Such fun! 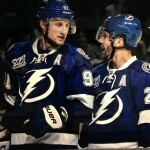 When my husband and I moved to Tampa in 2001, we didn’t hesitate to buy a 10-game pack to watch the hometown team in action, the Tampa Bay Lightning. 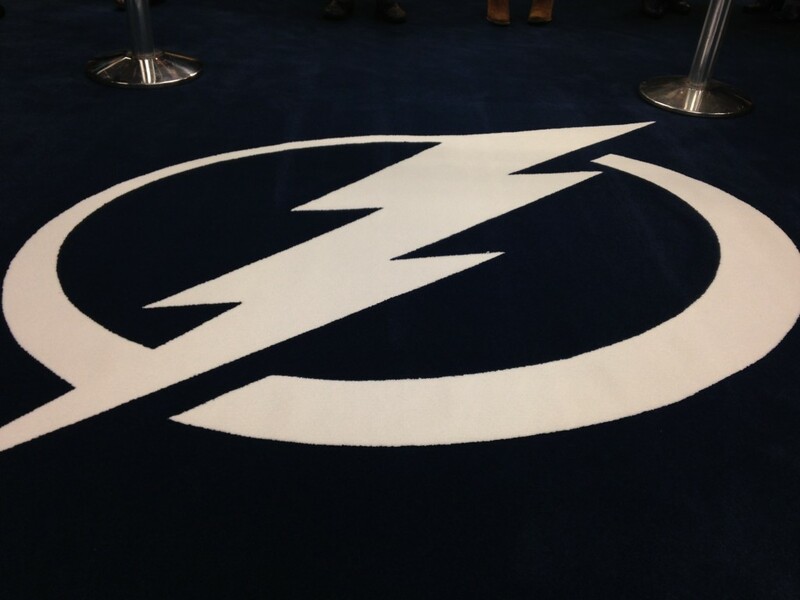 Ever since, the Bolts have been my team. Each year, when I get the notice from Alison that the date for Hockey ‘N Heels has been set, I try and clear my calendar to attend. 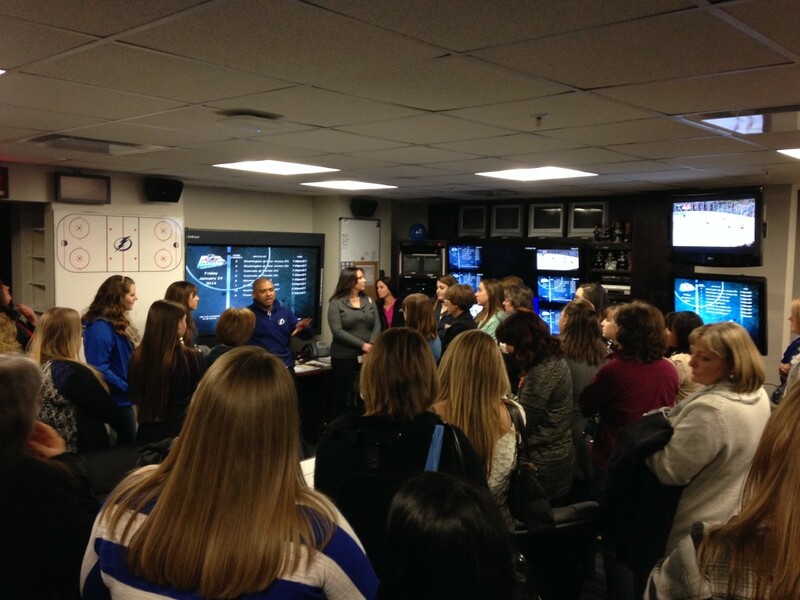 I love the idea of the Lightning setting aside time for women who are interested in the game the chance to go to the Tampa Bay Times Forum and learn more about the game. And the ladies who attend range from just learning about the sport, to die-hard fans who want more behind-the-scenes info. 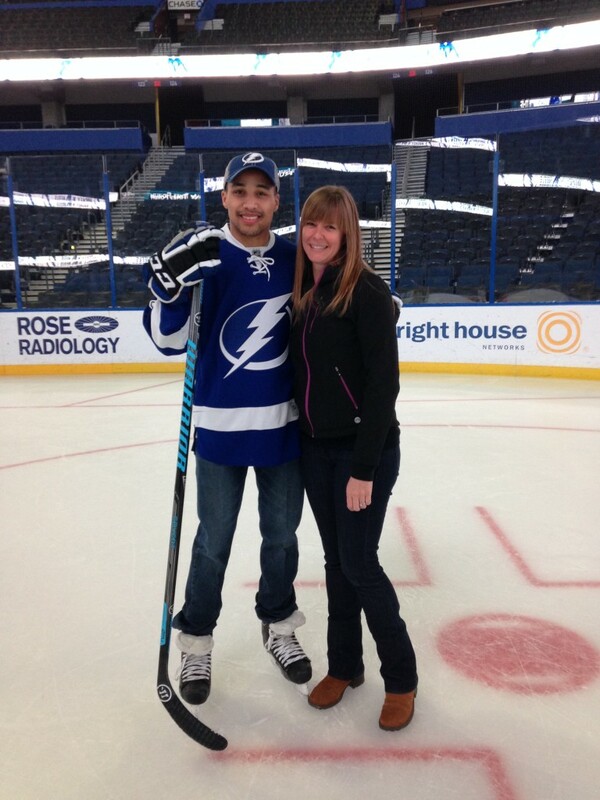 This year’s Hockey ‘N Heels, the Lightning’s 11th annual event held last week, didn’t disappoint. 180 ladies were broken into four groups and rotated through four different stations. My group started with the wives, which is always an interesting perspective. With this new season, there’s an entirely new coaching staff, and Jessie Cooper (head coach Jon Cooper) and Bonnie Gwozdecky (assistant coach George Gwozdecky) talked with us and answered questions. When Jessie talked about the frequent moves and upheaval of being in the hockey world, it reminded me a lot of growing up an Army brat and moving just as often. I wanted to assure her that her kids will turn out just fine – just look at me! Fun fact: Jon chews Double Bubble – one piece, throughout the entire game. 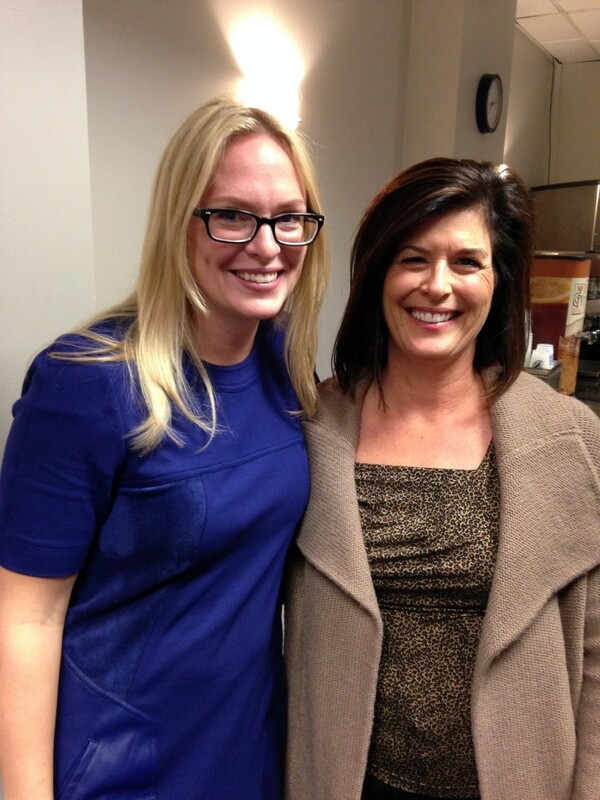 Jessie Cooper and Bonnie Gwozdecky. Next up, we met with Video Coach Nigel Kirwan. This may have been the most interesting part of the evening, to me. 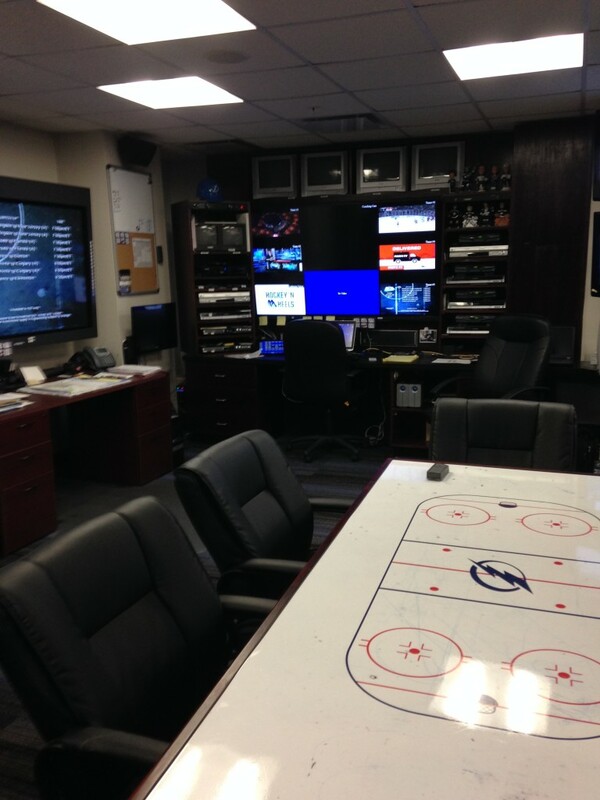 We gathered in Nigel’s “office,” surrounded by video screens and equipment. I loved hearing how he pre-scouts upcoming opponents, watching “A” “B” and “C” games, clipping hundreds of segments to review face offs, lines and penalty kills with the coaches, and then the team. A game plan is then developed and reviewed prior to the game. 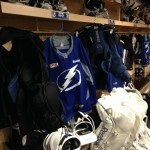 And this is done for every team that the Lightning plays. Wow. It’s always interesting to hear about the training that the players undertake to get ready for the season, and then during. And their medical care – intense! 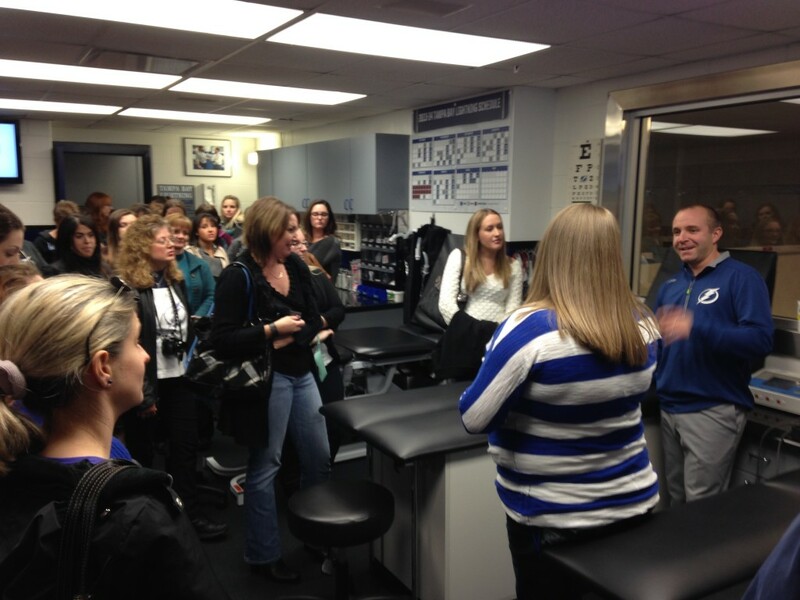 Assistant Athletic Trainer Mike Poirier walked us through the game and who all’s on hand for the team, every game, in addition to the trainers: a plastic surgeon, an ophthalmologist, a dentist, a chiropractor and an oral surgeon. Any stitches that need to be sewn, any bones that need to be set, anything along those lines are done so right there in the Forum. Even more impressive, everything that Steven Stamkos is doing for his rehab is done right there in the Forum (except for time on an underwater treadmill, which they have access to at the University of South Florida). 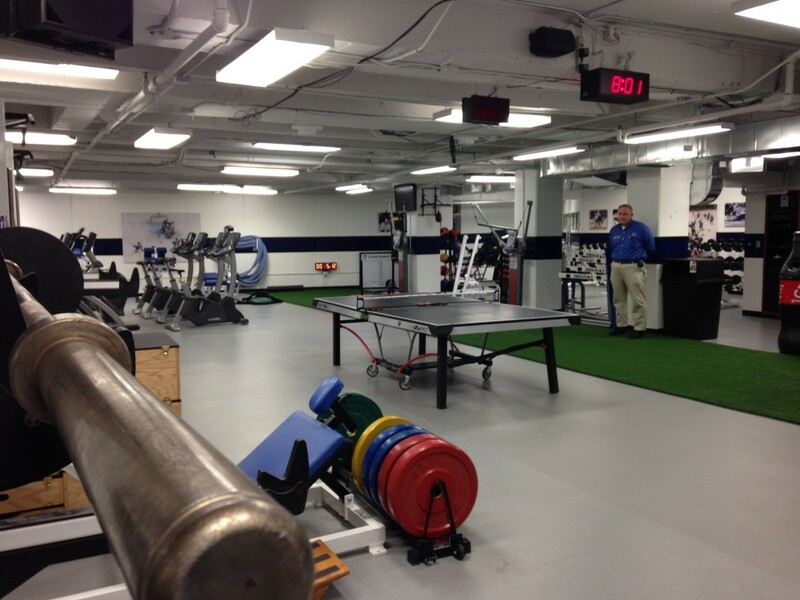 Outside of the trainers’ room, the weight room and work out facilities are ready to go. The team is expected to do their strength training in the off-season; during season, it’s all about maintenance and at least two workouts a week. 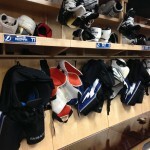 The more guys play on the ice, the less they train in the workout room. 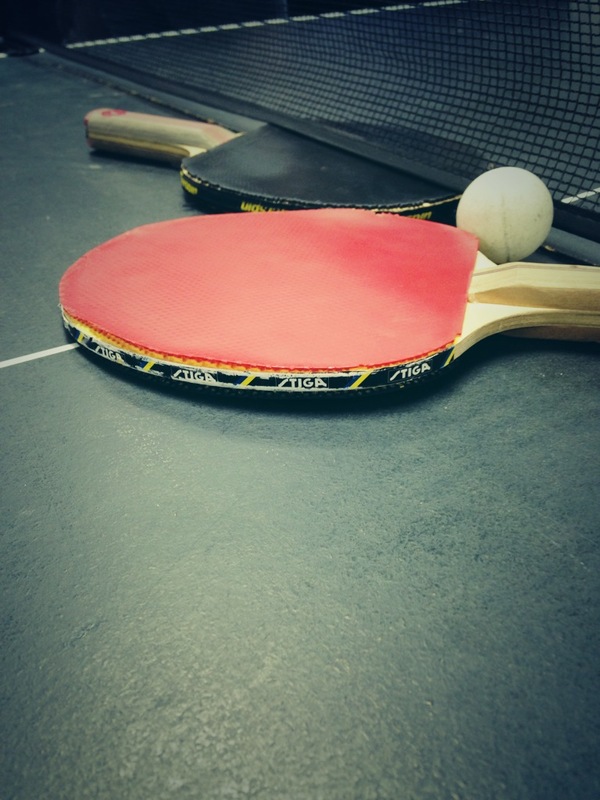 Perhaps the most popular feature of the weight room is the ping pong table – rumor has it Valtteri Filppula is best at the table right now. It’s probably safe to say that the ladies’ favorite part of Hockey ‘N Heels – and mine, too – is meeting a few of the players on the ice. I have to say, each player I’ve met over the years has been nothing but kind and nice and fun. 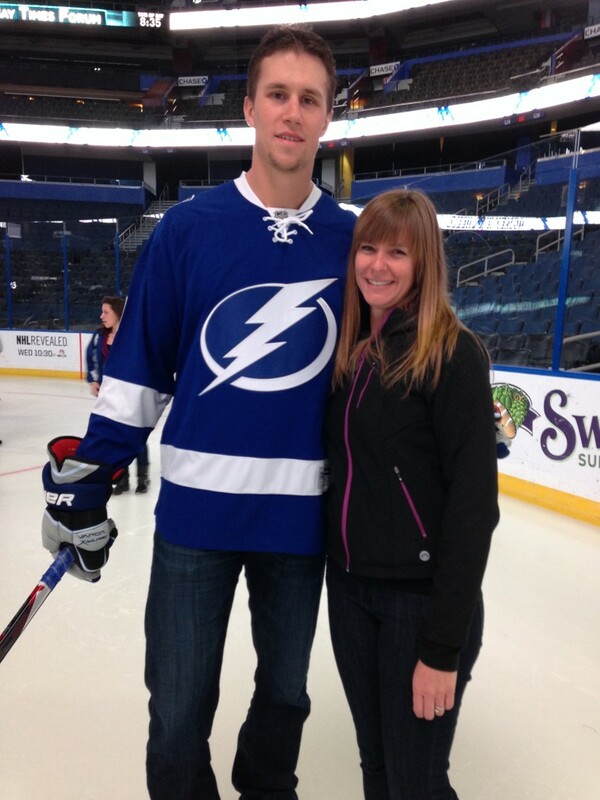 This year, our group met JT Brown, Ondrej Palat, Keith Aulie and Mark Barberio. Ladies took shots on goal, and talked with the guys about upcoming games and fighting strategies. 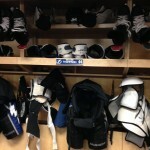 I chatted with JT about Minneapolis; with Ondrej and Mark about how Hockey ‘N Heels may just be the initiation for the new guys; and Keith about Gasparilla and how the team was going to miss out on the fun because of that night’s game. 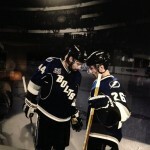 Ondrej Palat, me and Mark Barberio. 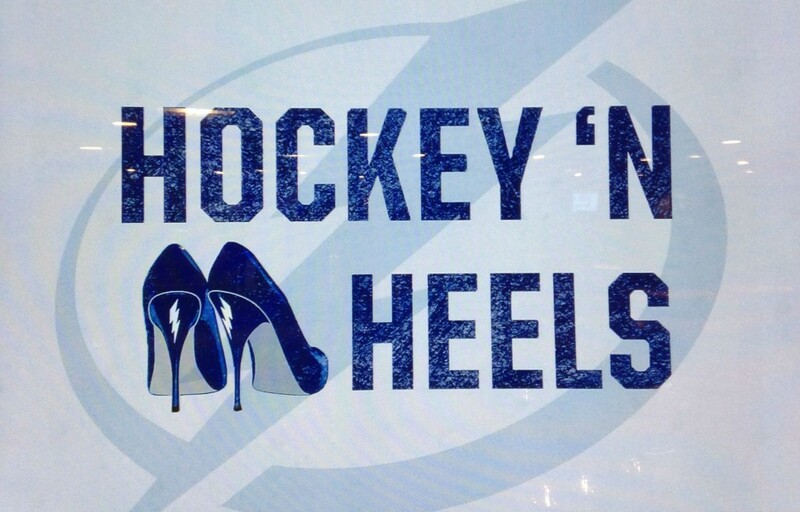 The Lightning’s Hockey ‘N Heels is such a fun event, and each year I learn something new. I’m already looking forward to next year! Inspirational photos line the walls. 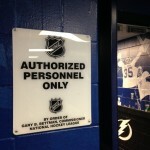 Going into the tunnel from the ice to the locker room. 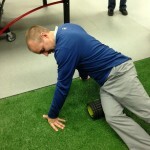 Assistant Athletic Trainer Mike Poirier demonstrating how I can roll out my IT band. Thanks, Mike! 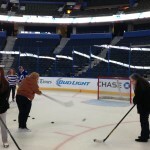 Ladies taking shots on the ice. 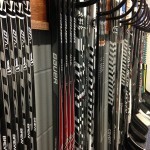 Sticks ready to hit the ice.